Glimpsing into the workings of another culture through cinematic storytelling can be rewarding on its own, but those kinds of films hold even more power when they tie together and reflect upon widespread, relatable social concerns. Lee Tamahori's Once Were Warriors offers such a look at New Zealand's indigenous Maori tribe and their perseverance in the modern era, highlighting how different descendants interpret -- or eschew -- their heritage. This cultural perception works as a filter, though, the added context behind a moving and harrowing glimpse at raising children amid alcohol dependence, poverty, and violent control over women. The events that transpire in Once Were Warriors aren't easy to stomach, yet the fraught, magnetic performances and the ways in which Tamahori binds those social issues to the tribal lineage makes for an effortlessly compelling and unforgettable portrait, one that justifies its zealous drama with poetic messages about one's roots. After leaving their small Maori town and marrying young amid much disapproval, Beth Heke (Rena Owen) and her husband, the brutish Jake the Muss (Temuera Morrison), live in a ramshackle house with their five children close to a New Zealand city. Jake struggles to hold down jobs, leaving him on government welfare ... and, gauging by his daily drinking and partying, seems perfectly content to continue doing so. Beth cleans for some extra money, but mostly she sticks around the house and cares for her husband and children, while also sporadically joining in with the boozy, singing lifestyle Jake brings home. Their children run the gamut: the two boys are rapidly approaching the realm of being full-on criminals, one, Nig (Julian Arahanga) who's close to joining a gang and another, Boogie (Taungaroa Emile), who has an approaching court date for minor felonies; the daughter, Grace (Mamaengaroa Kerr-Bell), on the other hand, has a gentle, poetic soul who helps clean up the house and care for the other two, much younger siblings. Disdain runs through them all for Jake the Muss, whose volatile attitude goes on the upswing shortly after losing his most recent job. 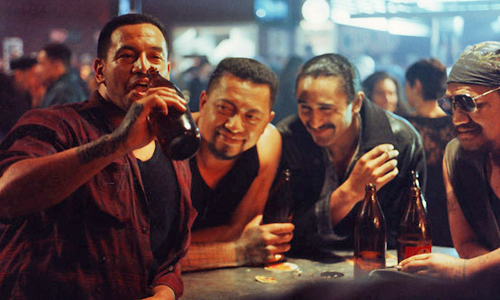 Lurking in the corners of the city and within Jake's regular bar, Once Were Warriors locates the descendants of the Maori people scattered around the poor sections of the unidentified New Zealand town, depicting the clash of tribal and urban ways of life as a tattered, tattooed, rough-and-tumble existence burdened by criminal activity. Alan Duff, the author of the eponymous book that the film's based upon, drew from his own experiences while conceiving the story, and that honesty and rawness comes through in the film's depiction of the social, economic, and philosophical challenges encountered by the indigenous people. By way of unflinching, sepia-leaning photography and a mix of jazzy local tunes and a soulful guitar-oriented rhythm from composers Murray Grindlay and Murray McNabb, Once Were Warriors pours those issues into the cramped Heke household, where sing-a-longs and laughter convey effortless camaraderie as the beer bottles pile up and the children listen in on the fleeting merriment from upstairs, awaiting the inevitable change in mood and the mess they leave afterwards. The years have taken a toll on the relationship between Beth and Jake, yet there's still passion and love there, making Beth's tolerance of her husband's behavior all the more heartbreaking. Sporting a few tattoos -- less than those of the local Maori gang members, mind you -- and a thick, intimidating frame, Jake the Muss is a force of nature who does little to control his dominant tendencies, largely because of the praise he receives from his buddies while doing so. It's the kind of respect one can imagine a burly warrior receiving at essentially any other time and place throughout history, though his love of guzzling beer and conquering foes clashes with the domestic life he should be tending to at home, something he cannot seem to grasp. Instead, he routinely upends his house with loud parties and even louder arguments with Beth whenever she's not accommodating to his needs, or, quite simply, when he's had too much to drink, fueled by Temuera Morrison's bestial body language and wide, piercing eyes. The viewpoint changes throughout to show how Jake's lifestyle reverberates across the entire Heke family, from the eldest son Nig's involvement with an imposing gang as a sort of surrogate family to the evolution of their gentle daughter, Grace, while surrounded by misogynistic, boozy instability. Amid all this, however, it's tough not to look at Beth as the heroine of Once Were Warriors, the one directly trapped underneath Jake's might whose actions and responses could dictate the future of her children. An absorbing portrait forms around how she navigates between the restrictions of being so poor, the threat of physical abuse from her brute of a husband, and the devotion she has toward holding her family together, commanded by a performance from Rena Owen that beautifully and naturally transforms Beth's trauma into a rediscovery of what those of her bloodline are capable of doing. Her wistful reflections on the past inform her tolerance and frustration with the present, which create a layered outlook on the highs and lows of Beth's maternal capabilities. 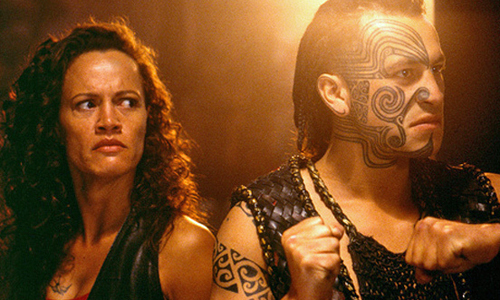 Every member of the Heke family embarks on their own journey in Once Were Warriors, forming into equal measures of heartrending tragedy and bittersweet triumph suffocating under the might of their patriarch. Director Tamahori creates an unrestrained perspective on the examples set and the ill-fated atmosphere created by Jake the Muss, then balances it out with the subtle ways in which these descendants of proud Maori people find ways of recapturing the spirit of their origin, enriched by the modern-day application of tribal tattoos, fighting with staves, and primal ceremonial chants. None of this happens easily, though, with the story leading the characters' difficult paths toward a poignant yet devastating conclusion that, in the midst of its saddening layers, also musters the strength of its characters and their ancestry. While specific to New Zealand's indigenous heritage, Once Were Warriors ultimately endures as a daring and universal portrayal of breaking whatever abusive, seemingly hopeless stranglehold life sometimes inflicts upon people.